When everything has to be just right, you’ll really appreciate having a MultiWash+™ Microplate Washer in your lab. Compact, quiet, and efficient, the MultiWash+ washer comes with the option of 20 different wash protocols, with variations that include adjustable speed and volume, adjustable aspiration speed and time, adjustable soak times, and three modes of shaking. Comes with four wash/rinse bottles. Configurable for both 96- and 384-well plates. 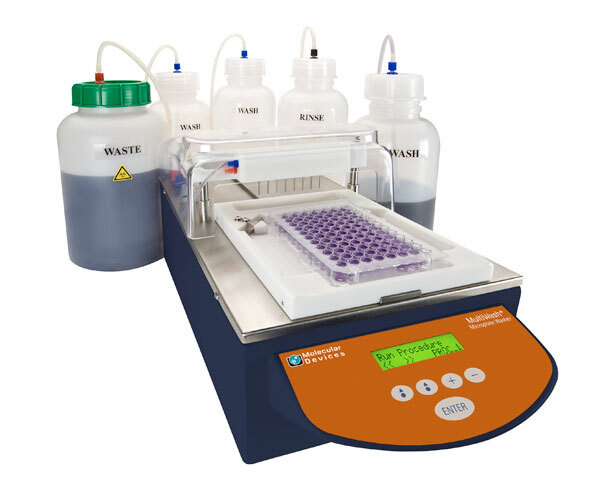 The MultiWash+ Microplate Washer is configurable for both 96- and 384-well plates and comes with four wash/rinse bottles and one waste bottle to make getting started simpler. The MultiWash+ Microplate Washer is geared to users that have lower throughput applications, but still want the benefits of a microplate washer. Any assay that needs washing as a primary, intermediary, or final step before quantitation is amenable to be processed on the MultiWash+ Washer. The MultiWash+ Microplate Washer is programmed using the on-board touch panel that comes with the option of 20 different wash protocols, including up to 8 cycles within each protocol for walk-up usability and flexibility. No external computer or software is necessary.